Castile La Mancha is the region in which you will find references to Don Quijote everywhere. 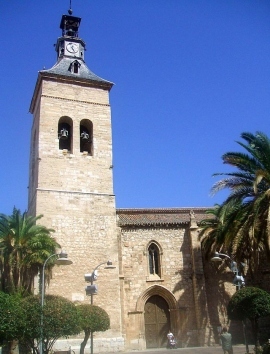 It is a region of historical importance, and a great place to soak in the Spanish culture as it really is. The capital Toledo is a great place to learn more about history and heritage while the different areas in Castile La Mancha give you a variety of opportunities to sample a typical Spanish lifestyle. 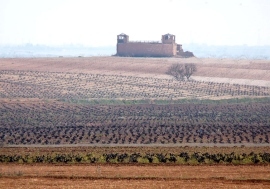 You might even think that Castile La Mancha is the Spain you know from books and fairy tales. The landscape is a varied, with a dominant tableland and some lovely, craggy mountains. 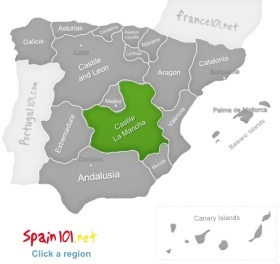 You can find virtually everything you would expect from Spain in this region – apart from beaches because Castile La Mancha is an inland region. However, the monuments, the cathedrals and the history will keep you so busy and enchanted that you won't even think about beaches! 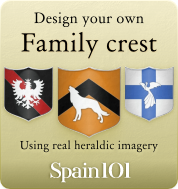 Castile La Mancha is famous for the people's skills in making weapons. The swords of Toledo are just one example of the famous weaponry in this region. A good place to visit if you would like to learn more about knife-making would be Albacete, though the modern town does otherwise not hold much interest for a visitor. Until 1560, Toledo was the capital of Spain, and had been one of the most important European cities during medieval times. There is plenty of impressive architecture to be seen in this city, and it also isn't far away from Madrid, so it is very easy to travel to Toledo. The Romans had laid their eyes on Toledo quite early on because it was nicely fortified – and being able to defend a town was always quite an important factor. Even today, you can still see how the fortifications of Toledo worked in the past. Toledo is a fascinating mix of historic buildings that show you how different cultures had an impact on this part of Spain during various epochs. You can see Gothic buildings, two mosques from the time of the Moors, and you can see many buildings from the 15th and 16th centuries as this was a time during which Toledo grew a lot. The Ciudad Encantada (enchanted city) is a fascinating place to visit. It is one of those places that make you realise how powerful natural forces are over time. The rocks in the Ciudad Encantada have been worn away by time and natural forces (like water, winds, erosion) and very interesting forms have been created. The enchanted city might look a little familiar to you if you have watched “Conan the Barbarian”, because it has been used in the making of that movie. The various stone formations have also received their own names, some of them area the mushroom rocks, el mar de piedra (the sea of stones), amantes (lovers), and los osos (the bears). Look at the formations and try to find out which name belongs to which formation – or make up your own names! 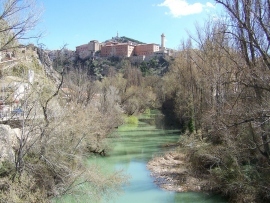 Cuenca is the best base if you would like to visit the enchanted city, but Cuenca itself has plenty on offer for you. It also is a great base to explore the surrounding area with its many area of natural beauty. It's the ideal mix of living in a city full of history and being able to spend time outdoors in beautiful forests and enchanting landscapes. Cuenca is full of sights and doesn't have to hide. There is a cathedral from the 12 century, the famous hanging houses (which are built up on cliffs and look like they could fall down any moment), the bridge of Saint Paul, from which you will have incredible views, a castle, plenty of old churches, the Mangana Tower (the origin of this tower is not really known, there are various theories about it), some lovely parks, and also some museums in which you can learn more about Spain's history, culture and heritage. Ciudad Real is the place you need to go to if you would like to visit the Don Quijote museum. This is also the part of Spain in which Don Quijote fought against the windmills. But you can learn all about that in the museum! Ciudad Real, however, is more than just the setting of a novel. You can also see plenty of historic buildings, and visit the beautiful Lagunas de Ruidera, which is a stretch that consists of seventeen different lagoons!